UNAFF Screening, Panel... and Award! Last week, Worse Than Poop! won the Grand Jury Award for Best Short Film at the United Nations Association Film Festival. We are so honored! Vanessa and Elliot take home the Grand Jury Prize for Best Short Film at the 2015 UNAFF. Held for the past 18 years at Stanford University, the UNAFF seeks to draw attention to the UN's Millenium Development Goals and, going forward, the UN's new Sustainable Development Goals. Elliot answers a question from the audience at the 2015 UNAFF. Our film was scheduled on the last day of the festival, in a section addressing climate change. The other films included DamNation and Antarctic Edge, and afterwards Elliot and I sat on a panel and answered audience questions with filmmakers Matt Stoeker and Dena Seidel. About to get on my very first Citibike! The day after the Peoples Climate March, I jumped on a Citibike and rode down to Battery Park, hoping to catch a glimpse of my hero, Naomi Klein, at the Flood Wall Street protest. Organizers use the "human mic" technique, developed during the Occupy movement, to prepare protestors for non-violent action at Flood Wall Street - a day of action after the Peoples Climate March, to draw attention to the root economic causes of climate chaos. Caffeinated and ready to march! I don't think I will ever forget September 21, 2014. I hope I never forget the feeling of being there - the feeling of being surrounded by almost half a million people, with love in their hearts, standing up and demanding a new course for humanity. Recently, and ever more frequently, I've felt this deep disconnection from the people around me - like I’m surrounded by sleepwalkers, all of us blindly headed for a cliff. Like I'm the only one awake to the danger we're heading toward, and I’m powerless to stop it. It's a kind of waking nightmare. At best, I might be in the company of a few others who feel the same - but sharing a common nightmare is, in some ways, even less reassuring. But in New York, it was different. Volunteering for the Peoples Climate March at Columbus Circle in Manhattan. In New York, I was part of a tide of people pushing in the opposite direction - so strong a tide that it was pushing me in the RIGHT direction. (And pushing a lot of other people too.) It's like the whole city - labor unions, families, senior citizens, everyone, even the police - just rose up and said WE HAVE TO CHANGE. When I learned on Monday night that the Rockefeller brothers had decided to divest from fossil fuels, I could feel the world shifting beneath me. I felt like I was at the center of a giant upswell of righteousness, and that maybe, finally, things were going to get better. Waiting (and waiting and waiting!) with the Interfaith contingent on 58th St. for the march to begin. It took some getting used to - to no longer being the crazy 'eco-active' mom on the block, and instead being just one of 400,000 people, all asking for the same thing. And it was strange to be engaged in an issue that is so personal to me, with so many strangers and so far from home. But if I felt solidarity from those strangers around me, I also felt that in a very small way, my being there was a source of strength and encouragement to others. Many times during the day, I would hear someone exclaim with pride and delight “Palo Alto - wow! you came all the way from California! That's so great!” And I was so grateful to be able to say, “Yes, my congregation sent me,” and to show them the photos I was carrying, and to let them know that others back home were marching too. Projects like the Climate Ribbon campaign also showed me that my grief and fear and hope are not mine alone - that we are ALL fighting, and praying, for the better world we know we must build for our children. I guess that the best thing about being at the march was that it gave me a taste of hope. For the first time, I believe we might actually win this. It’s going to take a lot of love, and a lot of hard work, to achieve any kind of climate safe future. And when I get back to California, I know it's going to feel weird all over again, and I'll go back to being the crazy eco-mom on the block. It's going to be hard, too, to hang on to this hopeful feeling, and to share it with my eco-active friends - who are increasingly terrified by the news coming in every day about the crazy-short amount of time we have to turn things around. But I'm going to remember - and remind them - that half a million people marched with me through the streets of New York. And together, we can move mountains. The last two days have been simply incredible. 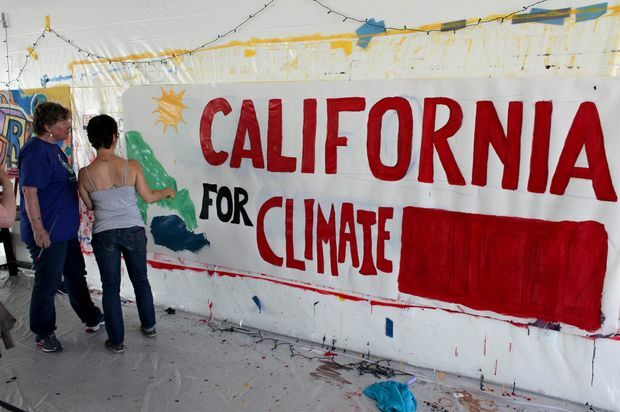 I began my day on Thursday by painting a banner for the California contingent at the Peoples Climate March, at MayDay artspace in Brooklyn. While there, I ran into Col. Anne Wright and Medea Benjamin, I got interviewed by WNYC radio, and I had the privilege of buying the artspace manager a falafel lunch. Entrance to MayDay Artspace in Bushwick, Brooklyn: ground zero for Peoples Climate art! From there, I went to a Peoples Climate March volunteer training, hosted by the NYC Transit Workers Union. On Friday, I did some phone banking at the Peoples March headquarters near Grand Central Station, with my new friend Linda Hutchins-Knowles. And on the way to pick up my protest signs at Kinko's, we ran into former US Congressman Dennis Kucinich! The Hon. Dennis Kucinich - with Linda Hutchins-Knowles, yours truly, and an unidentified Kucinich fan on Madison Ave.
That evening, Linda took me to a party for Moms Clean Air Force, hosted at a phenomenal upper west side apartment, where I got to meet people like EDF's Eric Pooley and IPL president Rev. 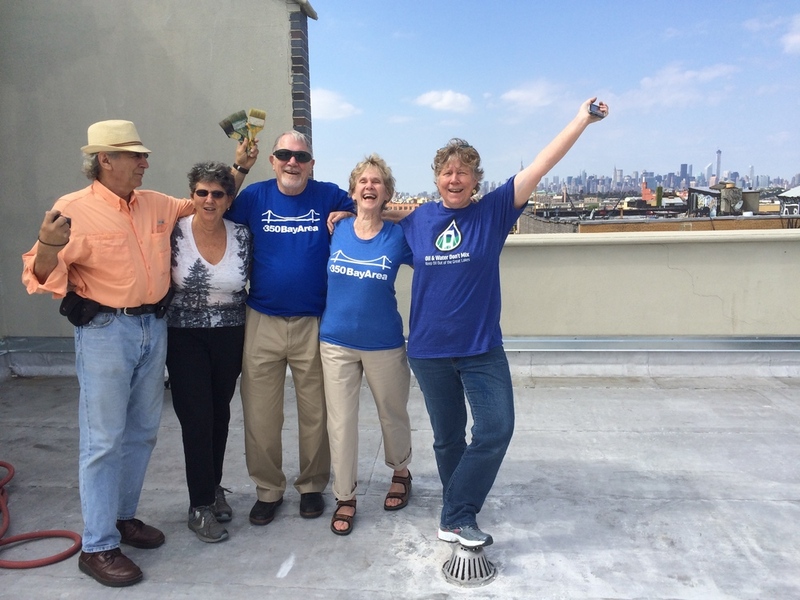 Sally Bingham, as well as some amazing climate-active parents from all over the country. On the way home, while passing out flyers to the march on the subway, I met Johanna Wald, of the NRDC, who assured me she'd be at the march in the morning. A perfect way to end the day!